No door in your house will dare to move, unless you ask it to. Search for a door stop that could be used at home or in the office? Are you looking for the one with decorative design and also stops the door securely? Did you ever try a few door stops which however do not work, and feel frustrated due to the return/refund hassle? "Best door stops we have used for multiple floor surfaces. - NCSteve"
"I love it! It's very useful, especially they have their own holders!!! - Aeyoung"
Our unique surface texture and non-skid base design allow the door stop to work on ANY type of floor surface. Push the door stop under the door and simultaneously pull the door over the door stop. This creates maximum tension and gripping power that allow the door stop to hold even heavy weight door with ease. - 3 High Quality door stops that cover most of the doors you need. - 3 Free Bonus holders to keep your door stops safe and organized when not in use. - Measure: L 4.8" x W 1.6" x H 1", fits under door gaps from 0.1 to 1 inch. Plus, our "Love It or Leave it" Guarantee: if you are not 100% satisfied, contact us for a full refund. And keep the product as our gift to you! Order Now at the Special Sale Price! 1. PREMIUM QUALITY RUBBER: Your new Door Stoppers are made of REACH certified odorless rubber. They have been rigorously tested and approved by SGS to prove they are safe to use. 2. BEST VALUE PACK: Your set comes with three free holder hooks to hang the product on any door and keep them safe and organized. Its colorful gift package makes it an original and thoughtful gift. 3. 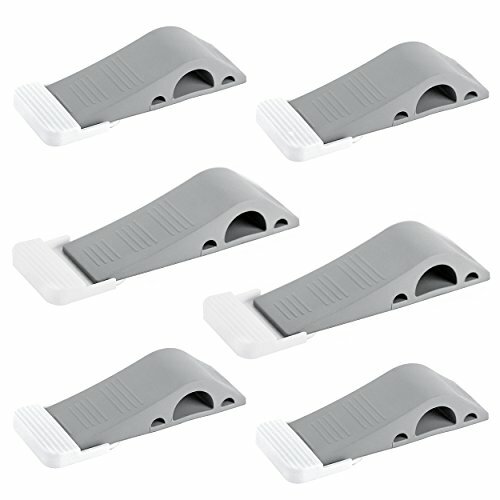 WEDGES DOORS LIKE NO OTHER: Our unique sloped design and anti-slip base provide ultimate gripping power and allow your door stoppers to work on EVERY FLOOR surface. Furthermore, they can hold even the heaviest doors. 4. THE IDEAL SIZE: Your new door stoppers measure L 4.8" x W 1.6" x H 1". They will fit under any of your doors hanging anywhere from 0.1 to 1 inch off the floor. If you have any questions about this product by Wundermax, contact us by completing and submitting the form below. If you are looking for a specif part number, please include it with your message.